Update: Now with video goodness. 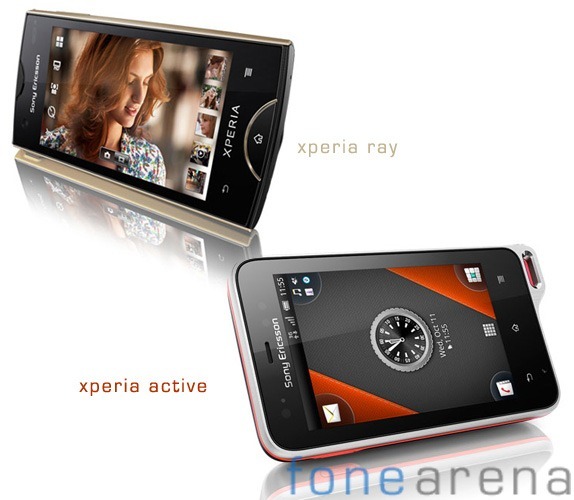 In fact, you can watch Maria Sharapova (don't get too excited) talk about the Xperia Active. And hey, she knows about active lifestyle phones, because she's sporty. Catch the other videos about the Ray (here, and here) and the Active (here). You know, if you want. Also, the word "lifestyle" was definitely used in describing the design of the Ray. I felt queasy. Today at CommunicAsia (we've never heard of it, either) Sony-Ericsson announced two additions to the Android-powered Xperia line of smartphones: the Ray and Active. Both phones are niche sort of "lifestyle" devices, and will probably be marketed more heavily in Japan than the rest of the world. However, it seems both (well, one, at least) will be available in markets worldwide this fall. The Ray appears to aim to resolve one of the great mobile hardware question of the early 2000's - how big of a camera can we fit on this tiny phone? The Xperia Ray sports an absolutely diminutive 3.3-inch display, albeit colorized by Sony's much-touted Mobile Bravia Engine. Simultaneously, it is fitted with an 8.1MP camera with Exmor R optics. And it does it all weighing less than 100 grams (hold your gasps, ladies and gentlemen). Next up is the Active. Unlike the Ray, the Active's name sort of implies what it's all about: Sportagizing(TM). But really, it's basically just a lightly ruggedized phone that comes with a wrist strap accessory and some very informative fitness apps and weather widgets (it has a barometer!). Both phones are powered by 1GHz Snapdragon processors, and run Android 2.3.3 Gingerbread. Exciting. To be fair, this hardware is definitely designed with SE's home market in mind - and it seems Japanese smartphone makers are having a hard time divorcing themselves from the idea of "lifestyle" devices aimed at specific demographics, a craze that never really caught on with smartphones in the US. So if you're a person who needs a phone that can fit in the change pocket of your jeans but also snaps great photos, or an athlete who finds buying a wrist strap and looking up fitness apps to be too much work, keep your eyes peeled for news on these phones in the coming months.